In August 2003, France sustained an unprecedented heat wave that resulted in 14,800 excess deaths. The consequences were maximal in the Paris area. The Assistance Publique–Hôpitaux de Paris reported more than 2600 excess emergency department visits, 1900 excess hospital admissions, and 475 excess deaths despite a rapid organization. Indeed, simple preventice measures before hospital admissions are only able to reduce mortality which mostly occurred at home and in nursing homes. It is clear from the atmospheric research reports that there has been an increase in the global mean temperature since the start of the twentieth century . The number of days exceeding the 85th percentile threshold value in summer for the apparent mean temperature in the United States has increased since 1948. This temperature increase is often responsible for major impacts on health [2, 3], as evidenced by the 1995 heat wave that resulted in hundreds of fatalities in the Chicago area [4, 5]. Heat-related illnesses were relatively uncommon in temperature climates , although recent publications report episodes of extreme heat causing large losses of life in northwestern Europe [6, 7]. The hospitals in France, especially in the Paris area, were recently confronted with the most deadly heat wave so far observed. Indeed, from 1 to 14 August 2003 the maximal and minimal temperatures reached unprecedented highs. It is interesting to note that the high temperatures were not accompanied with high relative humidity, as is usually reported . Within a few days of the onset of the heat spell, the Institut National de la Santé Publique et de la Recherche Médicale reported a sharp increase in the number of heat-related deaths . On 4 August, 300 excess deaths were observed. Excess deaths progressively increased until 12 August, reaching 2000 per day, and then rapidly disappeared in a few days. The cumulative excess deaths reached 14,800 over the entire month of August, which corresponded to a 60% increase of expected mortality in France . During this period heat-related illnesses were more frequent in elderly people, especially those who lived in urban areas, as previously published . Excess deaths gradually increased with age: +20% for 50-year-old people, +40% for 65-year-old people, and +70% for 85-year-old people . In contrast to the literature , the excess mortality of women tended to be higher than that observed in men (70% and 40%, respectively) . Also at increased risk were those who lived in an area that sustained a prolonged heat wave: a heat wave lasting 2–5 days was associated with a 52% excess mortality, and a heat wave lasting 6 days or more was associated with an 83% excess mortality. The number of deaths at home and in nursing homes was doubled . The consequences of the heat wave were maximal in the Paris area (Ile-de-France), where a 130% increase in expected mortality was observed . The Assistance Publique – Hôpitaux de Paris reported more than 2600 excess emergency department visits, most of them classified as heat related, and 1900 excess hospital admissions (Fig. 1), which unfortunately coincided with a common decrease of available beds during the summer period . The consequent workload sustained by nurses, physicians, and other hospital employees in emergency departments, medicine departments, and intensive care departments was huge. Indeed, 42% of deaths occurred in hospitals, while 35% and 19% of deaths occurred at home and in nursing homes, respectively. 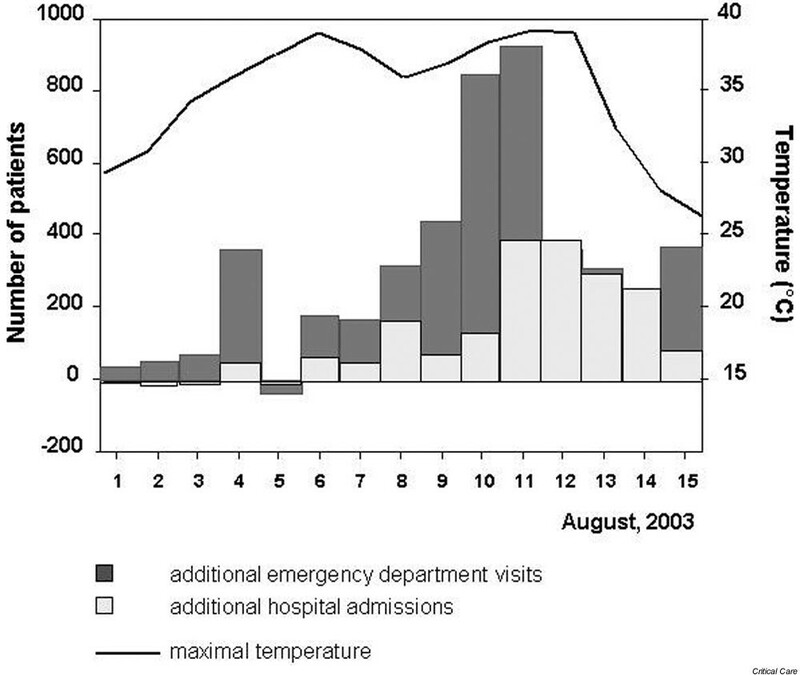 Maximal temperature in the Paris area, excess emergency department visits (grey bars), and hospital admissions (white bars) in the Assistance Publique–Hôpitaux de Paris, 1–30 August 2003. From 8 August, a special organization "plan chaleur extrème" (extreme heat plan) was set up that included an increased number of nurses in emergency departments and medicine departments, an increased capacity of the hospital wards (+350 beds), a decreased hospital stay for previously admitted patients, and a cancellation of admission for elective medical and surgical procedures. Among the 1900 excess hospital admissions, 475 excess deaths were observed despite this rapid organization. On 15 September, a large percentage of these patients were still waiting to go back home or to a nursing home. This finding confirms that, in addition to high acute inhospital mortality, heat-related illnesses result in a permanent loss of independent function in most survivors . The experience of the unprecedented consequences of a prolonged heat wave in Paris and in many areas in France reflects that, despite an extensive mobilization of the different hospital actors, simple preventive measures before hospital admission are only able to reduce the unacceptable mortality, which mostly occurs at home and in nursing homes. Home health care workers, friends, and the media (meteorological forecasts) can be effective in communicating health protection messages directly to the high-risk population; that is, elderly people with chronic underlying disease(s) living alone in an apartment in poor socioeconomic conditions . Anything that facilitated social contact was associated with a decreased risk of death during the 1995 heat wave in Chicago . Finally, air-conditioned environments should be readily available and accessible in nursing homes.